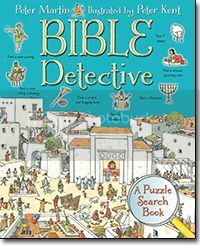 We have had so much fun with Bible Detective: A Puzzle Search Book by Peter Martin. What an incredibly cool book. Young detectives will never tire of this picture-search puzzle book. Readers can pore over seventeen cleverly illustrated scenes of Bible events to find the answers to the questions posed on each page. Some puzzles involve looking for details of everyday life, others highlight things that happened in the Bible stories--offering hours of fun to readers as they search for the answers. With lots to find, this kind of picture book is particularly great for reluctant readers and visual learners, helping all children get an overview of the Bible's history and content as they super-sleuth their way through the book. Warning: may be addictive! This book ended up pulling everyone in. If you check out sample pages, An Assyrian Attack and The Port of Caesarea, (keeping in mind that in the book, this is definitely easier to use!) you can get a good feel for how the book works. Each two-page spread includes a little bit of text about the Biblical account or place. Then, around the sides, there is more text along with illustrations. This text tells the kids what to search for in the big illustration, and often tells a bit more about it. For instance, in The Port of Caeasarea, one of the side illustrations explains that "Amphorae were used for transporting goods such as wine, oil, and fruit." You are told there is a wagon loaded with amphorae for you to find. If you search and simply cannot find something, there is an answer key in the back of the book. We found that very helpful at times! What I love is that the kids are not just searching the picture for miscellaneous stuff. (Well, except for the fox that appears in each spread. He's pretty miscellaneous.) They are learning more about the Bible and biblical times and places. The illustrations are fun, and sometimes funny. Peter Martin has developed a wide knowledge of Biblical history during his many year working in religious education. He acted as advisor on The Lion Bible In Its Time. Peter Kent's focus as an illustrator is bringing historical scenes to life with humor and detail that appeals to children. He has been illustrating for over 30 years and has created over 12,000 illustrations for children's books.